The Mars Pathfinder mission, launched on Dec. 4, 1996, was designed to demonstrate a low-cost method for delivering a set of science instruments to Mars and sent the first wheeled vehicle to be used on another planet. The mission served as the foundation for all future Mars rovers. Although I eagerly followed the exciting news of the Pathfinder mission via an adolescent internet (14.4k dial-up, woo!) Lights in the Dark wasn’t in existence back in 1996 — there really aren’t many blogs that were — so with the upcoming MSL landing on August 5 I thought I’d share a look back at Curiosity’s spunky little predecessor, Sojourner. 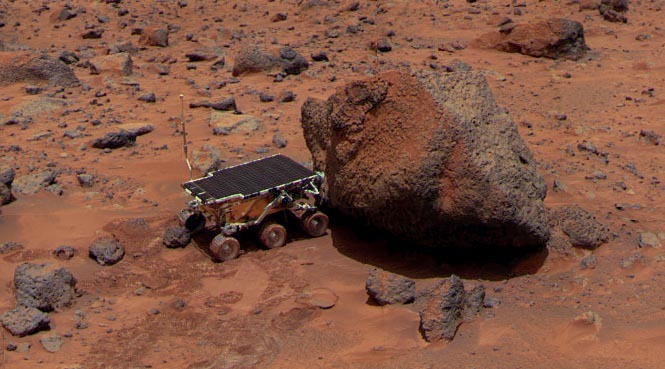 The Mars Pathfinder mission landed a 1-foot (30 cm) high rover named Sojourner (after civil rights crusader Sojourner Truth) on the surface of Mars on July 4, 1997, using an airbag landing system and the innovative petal design of the lander — dubbed the Carl Sagan Memorial Station after landing. These designs were used since in various incarnations to land other rovers on the Red Planet. Sojourner spent 83 days of a planned seven-day mission exploring the Martian terrain, snapping photographs and taking chemical, atmospheric and other measurements. It also performed a number of technology experiments designed to provide information that will improve future planetary rovers. The last successful data transmission cycle from Pathfinder was completed at 3:23 a.m. PDT on September 27, 1997, which was sol 83 of the mission. A final signal without any spacecraft data was received on October 7. Although the cause of the loss of communication with the lander may never be known, engineers suspected that depletion of the spacecraft’s battery (which was designed only to last one month) and a subsequent drop in the operating temperature of the spacecraft were to blame. Both lander and rover outlived their design lives — the lander by nearly 3 times, and Sojourner by 12. The trove of information gathered by the little Sojourner rover paved the way for future generations of robotic Mars explorers, from Spirit and Opportunity to Phoenix and of course the latest and greatest Mars Science Laboratory rover, Curiosity. Find out more about the Pathfinder mission here. Added: Of course, Sojourner was the first rover that worked. The first rover ever sent to Mars was Prop-M aboard the Soviet Mars 3 spacecraft in 1971, which ceased communications 15 minutes after landing, never deploying the rover. Read more here. I hope I can see in a few years a man piloting a rover on the surface of Mars and… not managed since the Earth ! !